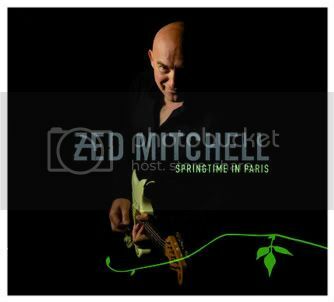 Zed Mitchell is in all musical areas and is a composer and lyricist with over 20 albums published, a singer in a class with a 5-octave voice and guitar player who is among the best in Europe. With his band, he played alongside Santana, Joe Cocker, Deep Purple, Larry Carlton, Robert Cray, Joe Bonamassa, and other artists. He jammed with the singer Bobby Kimball (Toto), bassist TM Stevens (Tina Turner, Joe Cocker), the drummers Ricky Lawson (Michael Jackson) and John Blackwell (Prince), Curt Cress, Blues Company. In 2006 he played with blues legend B.B. King on his, it seems, the last European tour at the last concert in Luxembourg. On his "Springtime in Paris TOUR 2008" he played at the Montreaux Jazz Festival, Luxembourg Blues Express Festival, Magdeburg New Orleans Festival, Kiel International Blues Festival, and as a special guest at the Blues Company concerts. His guitar solos you can with CDs of Eros Ramazottis (Musica e.. "), Natalie Cole, Udo Lindenberg, and in the MSSO (Munich Symphony Orchestra)" Vol.5 Pop goes classic "on the CD, and various film projects heard ("Indiana Jones"). On his latest album, "Springtime in Paris", it turns out the blues in all its facets and takes the listener as well as his inspiring concerts, in its spell. Translated by Google (and not very well, if you have a good BIOS in English, please e-mail me.